Pop quiz: Can the aircon of the Toyota Altis be cleaned without removing the dashboard? Almost everybody, including experts from Toyota Service Centers, would say “No“. But the correct answer is: “Yes” — if you use the B-Quick system. I learned about B-Quick just today. My Altis, whose aircon is religiously cleaned every year (via the traditional “pull-down evaporator” method), experienced it’s first “B-Quick treatment” in a shop located in Mindanao Avenue today. They use a combination of specialized equipment and specialty chemicals from the US to do the cleaning. 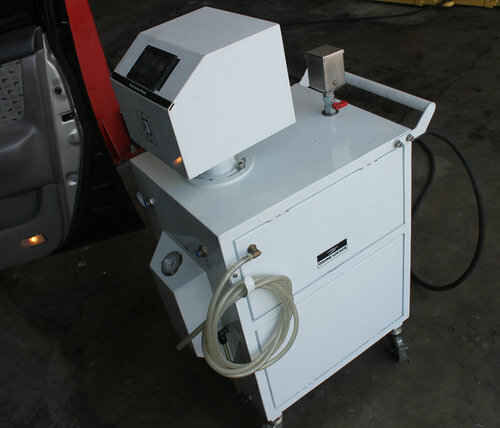 It’s a self-contained computerized system that manages the flow of cleansing products, water, and ozonized air used for the process. They also have a nifty camera system that uses a flexible scope to see the evaporator even while it is still behind the dashboard. They use premium-grade coil cleaners that effectively clean and preserve the evaporator. With the optimal mix of air pressure and cleaning chemicals, they “pressure wash” the evaporator fins pushing out dirt and grime from the surface and between the cracks. Afterwhich, the machine switches itself and push pressurized water to rinse the evaporator. Remove dashboard by disassembling the dashboard cluster. Disconnect electrical connections underneath the dashboard. Pull-down evaporator and commence manual cleaning. Re-assemble evaporator, replace refrigerant and check for leaks in the connections. Reconnect electrical connections and re-assemble dashboard cluster. Often, I’ve seen this process causing damage on my dashboard (“unexplained” surface scratches, broken clips, misaligned panels, missing bolts, nuts and screws), faulty electrical components (non-working devices due to broken connectors), and deformed evaporator fins. 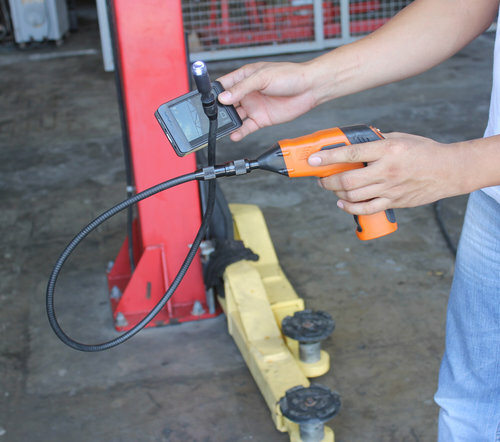 Prepare cleaning service access (put drip pans and plastic mats) and inspect evaporator using a high tech scope/camera. Use B-QUICK machine to systematically apply the proprietary cleaning solution, rinse, vacuum and expel dirt and grime. Cleanup and re-install service access portions. Purify entire cabin with Ozone. In terms of time, the traditional process took about 4 hours to a whole day to complete; while the B-Quick process took just a little over 1 hour. In terms of cost, I was pleasantly surprised that the B-Quick solution is even cheaper than the traditional pull-down offerings I availed of in the past. Note that aircon shops normally charge higher for the Altis precisely because it requires the removal of the dashboard to gain access to the evaporator. 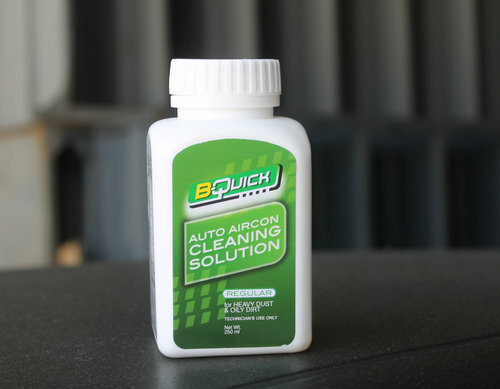 The B-Quick system works for all types of cars. In fact, it works best for newer cars where access to evaporators is becoming even more restrictive. Case in point, for my friend’s Ford Expedition, it used to take several days to clean the aircon; with B-Quick, it’s done in a few hours. So there you have it — a quick, efficient, cheaper, and lower risk approach to cleaning your Altis’ aircon without the hassle of removing the dashboard, opening up the aircon’s “sealed system” and waiting for as much as a full day to finish. Previous PostSponsored Video: Volvo’s new line of trucks made for AsiaNext PostQuestion from a Reader: Is Cleaning Just the Car Aircon’s Evaporator Enough? I would like to know where is this shop located. Thank you sir for sharing this info. May we know where the shop locate, we prefer Ortigas Area. Do you service also a Nissan Grand Livina ? How much is the cleaning? Were can i find car aircon machine like you shown in this ads? Thanks in advance im interested to have it for my future auto aircon shop. may i know the exact address of d shop n how much does it cost for an old pajero. thank u. Would like to know your qoutation in cleaning car aircon and which place is your nearest shop, im fr baguio. Panget ang bquick.. Mababasa pa carpet mo..
Do you have shop near in cubao area? And visa card for payment are ok? And also to clean the compresor?